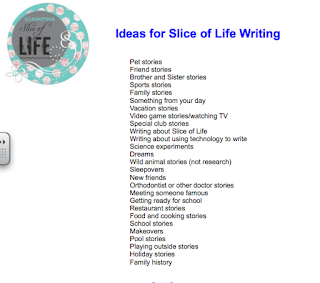 Thanks to Stacey and Ruth of Two Writing Teachers for hosting Slice of Life Challenge. You can view other slices here. Whew! It's been a busy couple of days getting ready for the Slice of Life Challenge. Yesterday, Mrs. Miller's class invited me in to answer questions about the challenge. Their questions were very thoughtful. These third graders are ready to go! Mrs. Miller is going to give her kids time to write in school every day after recess. They did a practice session on Thursday. She put on quiet writing music and they all sat around the room and wrote for 15 minutes...including Mrs. Miller. They were so excited when I stopped in to wish them good luck. They eagerly gave me their papers so that I could read them. I am honored that they wanted to share them with me. I'll be busy writing comments to them all. I want them to see how much those comments mean. My students gathered today to come up with our list of writing possibilities. They were on fire! The ideas were flying and I was excited to hear one of them suggest writing about using technology to write. They eagerly took their journals home Thursday night so that they could have their first entry ready Friday morning. By the time I got home from school (and I did go to dinner first), I already had 2 blogs linked to our classroom blog from 2 boys. Mrs. Corson's kids are ready to go too. Their journals are made (although there was a glitch in the creation of journals...the stapler went haywire...so, a few need to be redone). Her students will be writing together during the morning when they first come into the classroom. In addition, I gave our principal a quick lesson on how to write a blog. She'll be blogging on our Kidblog account so it will be easy for the kids to find her work. If she finds she likes blogging, she'll set up her own blog after the challenge. Finally, I wanted to post a clip from our Skype visit with Stacey from Two Writing Teachers. Feel free to share with your students if you think it would be helpful. I'm looking forward to a great month of writing, connecting with other writers/bloggers, and sharing this wonderful experience with the students and my colleagues at school. I am looking so forward to reading about your experiences within your school. What a great way for you to introduce so many people to blogging. You can be my model for next year to get more of a non-virtual writing community going. Thanks Melanie! I'm excited that 2 classrooms are joining my class in this adventure. When the principal passed my class in the hall yesterday, she danced around and said, "It's the first Slice of Life!" The kids are looking forward to her writing too. Wow. You guys have it going on! I'll have to jump over to the classroom challenge and check some of these out! 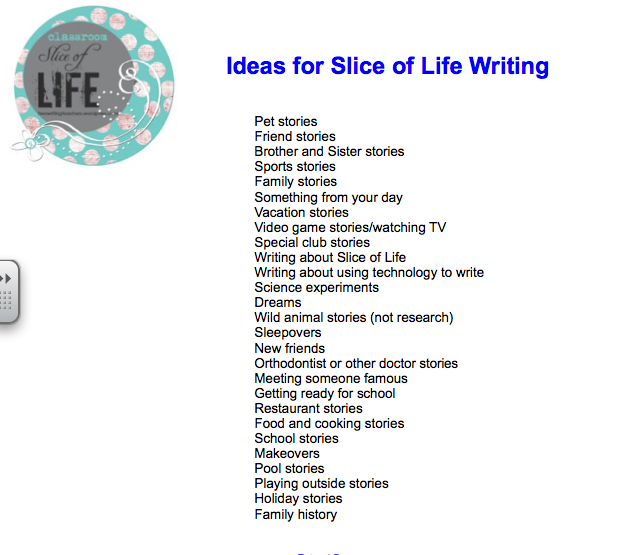 I really like the list you have for kids about post topics. I may have to steal a few! Sometimes the sweetness comes in the preparation. Good luck this month. I'm glad you're writing. Third graders can do it! We used journals last year...no blogging. I'm taking baby steps this year with asking the kids to blog. Some will blog every day and others will do most of their writing in journals. You will love what you learn about your kids through doing the challenge. I love the excitement of the kids! I'll bet this becomes contagious and more will jump in next year. Way to go Julie! I love the way that you're integrating the technology! Having your principal on Kidblog with the students is pure GENIUS! I may have to steal that idea as soon as I'm back in the classroom. I was so glad the principal accepted the invitation. I think she's as excited as the kids. I know I am! Her first story is hilarious. So many things happen behind the scenes in the office that we don't even know about down the hall. What an exciting adventure. I'm looking forward to hearing how it goes. Thanks Lori! It's going to be fun, I know it. I love that the students are pumped about writing! I hope that feeling continues throughout the month! Me too, Michelle. I think we'll keep each other motivated.